Before I could send Pam a recipe, I emailed her asking for a better description of the dish. I thought she might have been referring to manti - the tiny boat-shaped dough with ground meat filling - that's baked in the oven. I gave this some more thought and suggested the Greek recipe Pastitsio - pasta, meat, tomato, topped with bechamel sauce, then oven-baked. Pam said the recipe she was seeking was made with spaghetti, meat, tomato. All together in oven. I told her I’d see if there was anything else I could find, although I really didn't know of a specifically Armenian recipe for spaghetti, meat and tomato baked in the oven. I was going to post the recipe after Pam made it so I could include her evaluation, but she’s in Armenia right now. So while I await her return, I figured I’d make it for dinner. We hope to hear from Pam later on. My version was a bit different from the original. The changes I made are listed below Rose Baboian’s recipe. Sauté: ½ lb. ground meat (lamb or beef) in ¼ cup butter or margarine for 5 minutes. Stir constantly. Add: ¼ cup (1small) finely chopped onion. Continue browning 5 to 8 minutes more. Bring to a Boil, then Simmer about 5 minutes. Boil: 3 quarts water with 1 ½ Tbsp. salt. Add: ½ lb. macaroni of your choice. Cook: according to package directions; Drain. 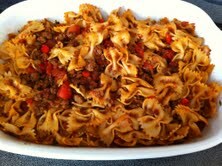 Mix together: with meat mixture. Spread: into a 9”x9” baking pan. Bake: at 350°F for 30 to 35 minutes. Stir once or twice during baking. Serve hot. I omitted the butter in the meat-cooking step. Any excess fat was drained from the skillet. I used: ½ cup diced red peppers, 1 cup diced tomatoes with liquid, 3 Tbsp. tomato paste, about ½ cup water (or more to make it more sauce-like), farfalle (bow-tie) pasta, and increased the seasonings (except the salt) according to our taste. Plain yogurt was served on the side. Our evaluation: It reminded us of Manti in casserole form. Pretty good, really, and very easy to prepare! penne macaroni,ground beef or turkey,jar of sauce (i like Barillo sauce) one chopped onion, two cloves of garlic,you can add oregano or basil, parm. and shredded mozzarella cheeses. Add a handful (1/4 cup) pine nuts to the meat with the onions. Also add the allspice, black pepper, and red pepper at that time. Add the chopped garlic towards the end. Instead of the green peppers, my mom used to put green peas. Just a little will do. Use egg noodles, though of course any pasta will do. Don't forget to butter the pan. 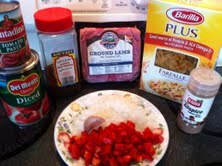 Instead of mixing everything together, lay down a layer of pasta, then add the meat, then a final layer of pasta. Put shredded parmesan (or a similar cheese) and bread crumbs on the top, for a gratinee effect. I like the Marsala wine. It is easy for this dish to come out dry if you do not make sure that the meat mixture is moist. Alternatively, I think you can mix shredded mozzarella or another creamy cheese with the pasta (though it is a bit overkill for me). My mother-in-law makes a similar dish but all done on the stove top. Yummy indeed. Maybe the baking gives it a bit more crunchiness on top? I'll have to give this a try! not get sick of it!